Research in Turkey's southeastern Siirt province has revealed the 5,000 year old story of eight young people who were buried as 'retainers'. A paper published recently in the journal Antiquity by UCL researcher, Brenna Hassett and Ege University Professor, Haluk Sağlamtimur describes the tomb uncovered at the site of Başur Höyük as containing a huge wealth of metal objects and the remains of two children of about 12 years of age, along with some other human remain fragments. Just outside the inner chamber, where a small stone was set as a 'door' to the stone tomb in the direction of the two 12 year olds feet, excavators found the piled bodies of eight young people. The burials were dressed impressively, with beaded chest plates and ornate metal pins for their clothing, included both males and females, and ranged in age from around 11 to 20 years of age. Clear evidence of violence was found on the skeletons, with the skeleton of one of the young adult males showing sharp force trauma wounds to the skull and to the hip. The discovery of this retainer burial forms a part of a larger project to explore the changing nature of society as the world's earliest states were beginning to develop in Mesopotamia. The possibility that human sacrifice or retainer burial were important to this process is echoed by similar findings from early states around the world, and from well-known finds such as the bodies identified as human sacrifices from the Royal Cemetery of Ur, dating 500 years after the events at Başur Höyük. 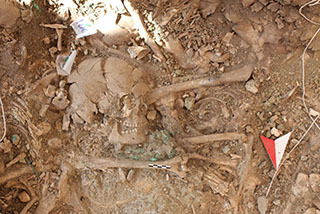 At Başur Höyük, not only are there elaborate and wealthy tombs with victims of retainer burial, but in 2014 excavators identified a large burial that was eventually revealed to be a mass death pit containing around 50 individuals. Research is now going ahead, funded by the AHRC, to identify these individuals in an international collaboration including the study authors and UCL's David Wengrow, aDNA researchers from the Natural History Museum and stable isotope research at the University of Georgia, Athens. Bioarchaeological investigation will hopefully soon shed light on what happened to these people some 5,000 years ago, and how their deaths relate to the rise of the world's first states in Mesopotamia.